Last Sunday Lola, Mathilde and I joined what seemed like half of San Francisco and headed to Market Street to watch the annual Pride Parade. It was out first time going to Pride and the girls absolutely loved it! 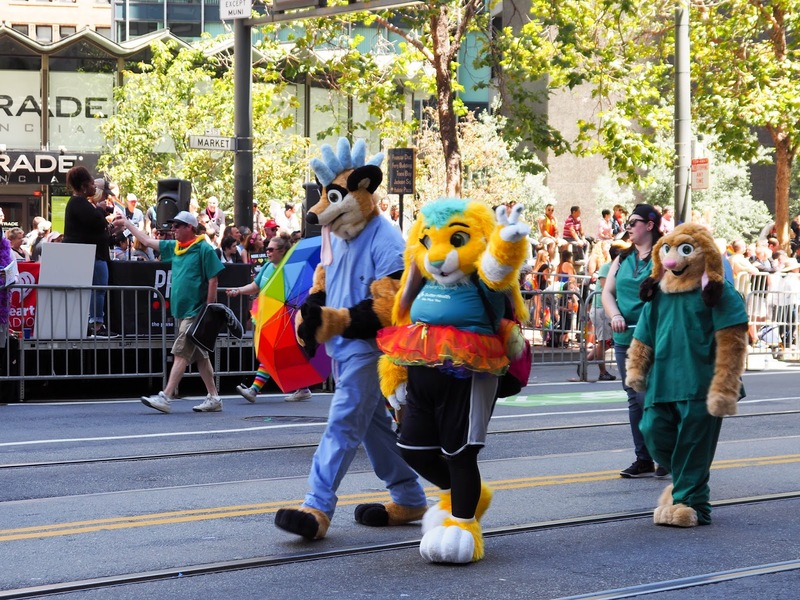 I had hoped to make it a whole family outing but Ava, ever the jaded tween, declared that parades are boring and didn't want to come along. 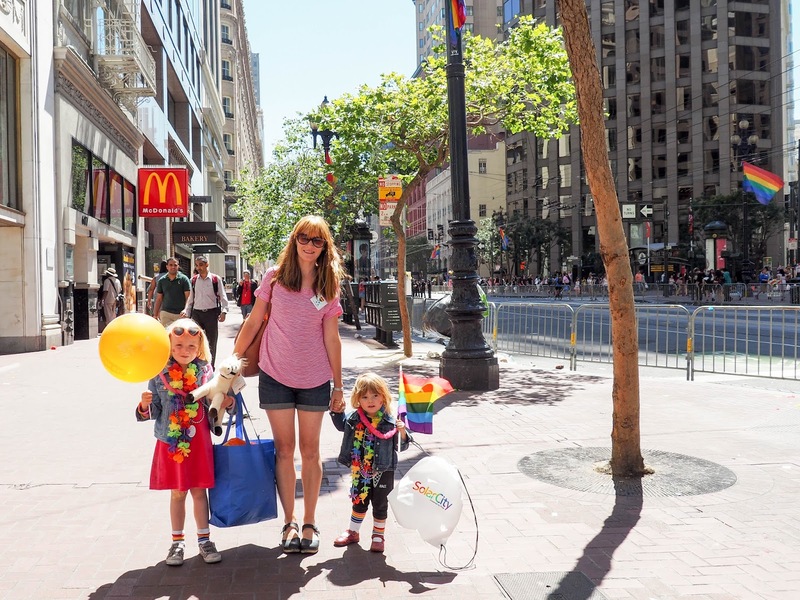 So Kim stayed home with her while I took the younger girls into the city. 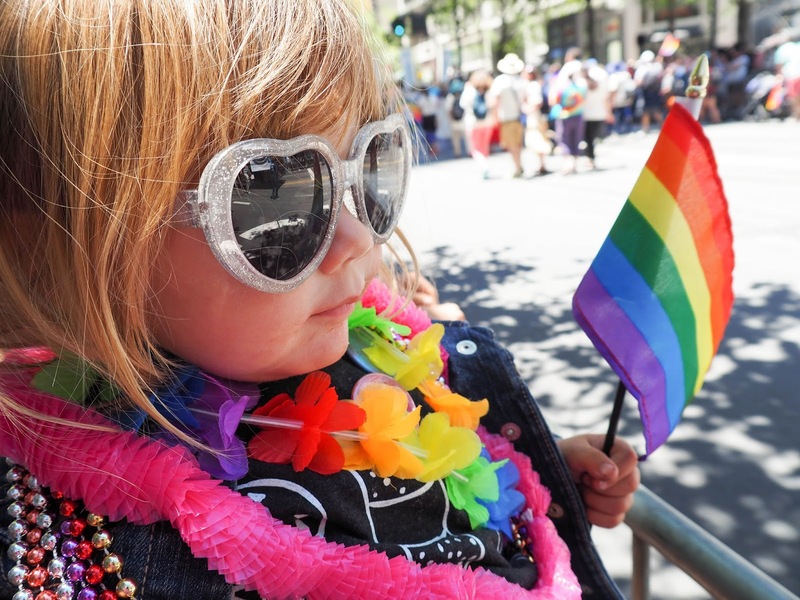 To be honest, I think she was a little jealous when we got home and she saw how much Pride loot her little sisters had scored at the parade, but she wouldn't admit it. 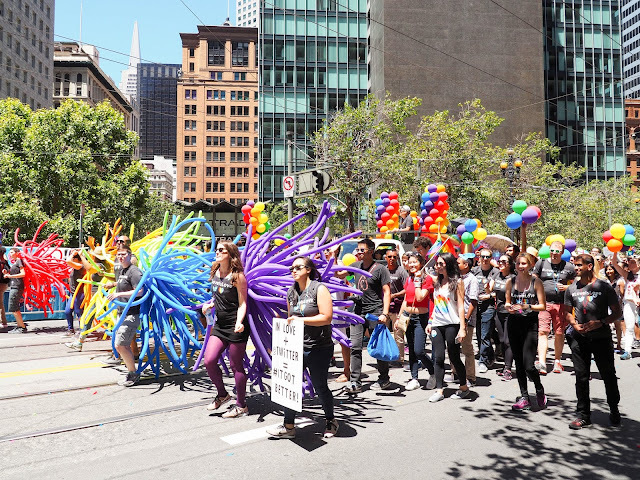 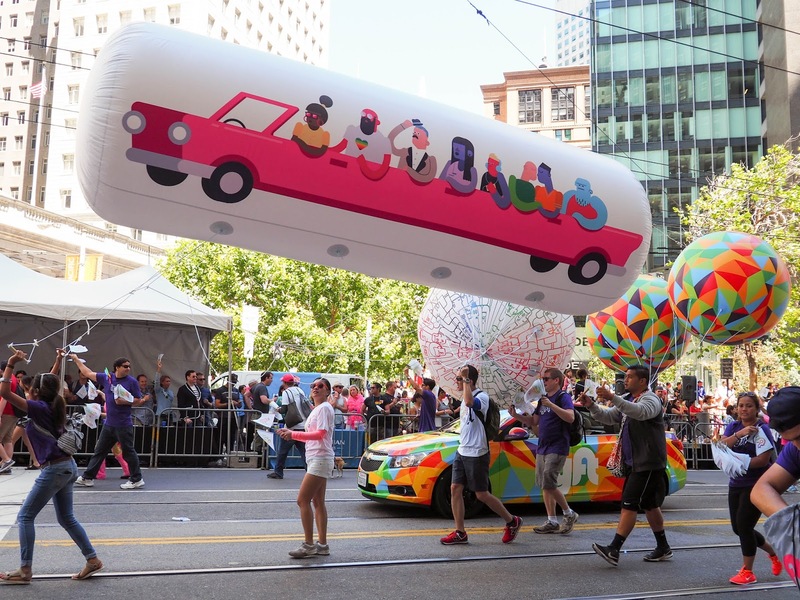 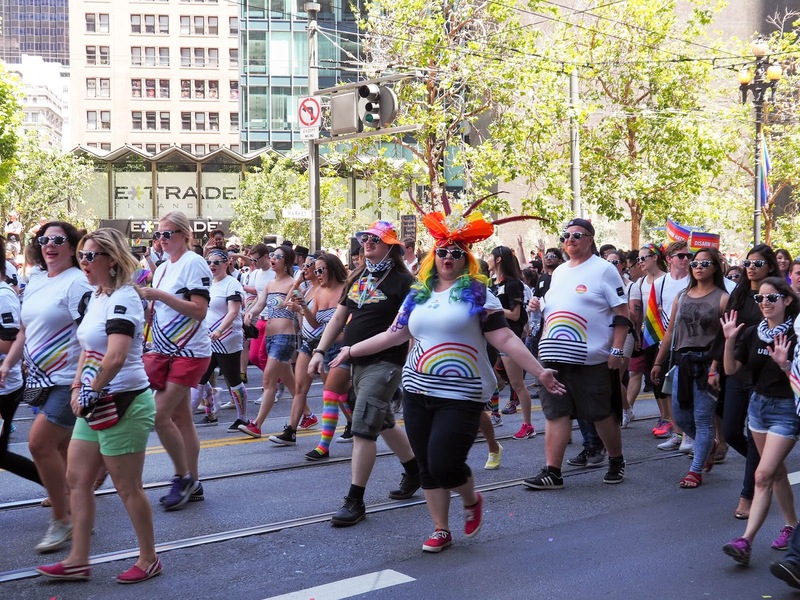 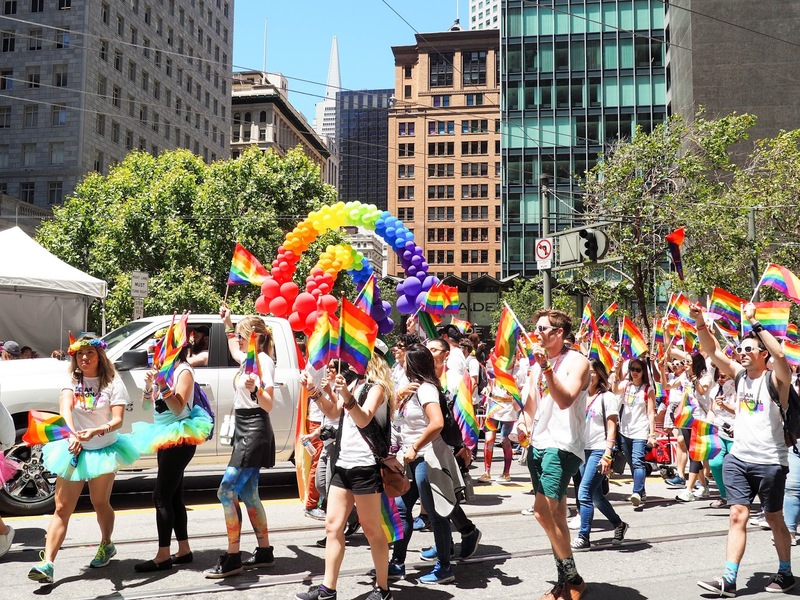 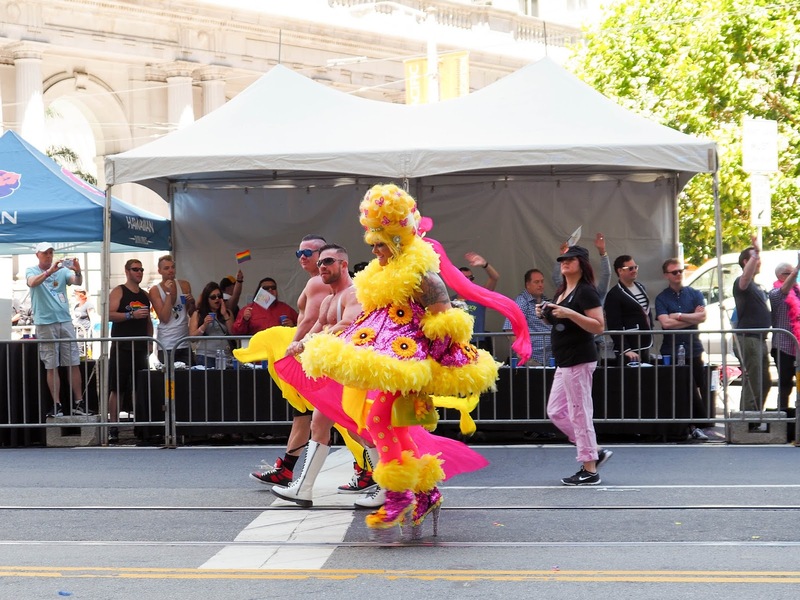 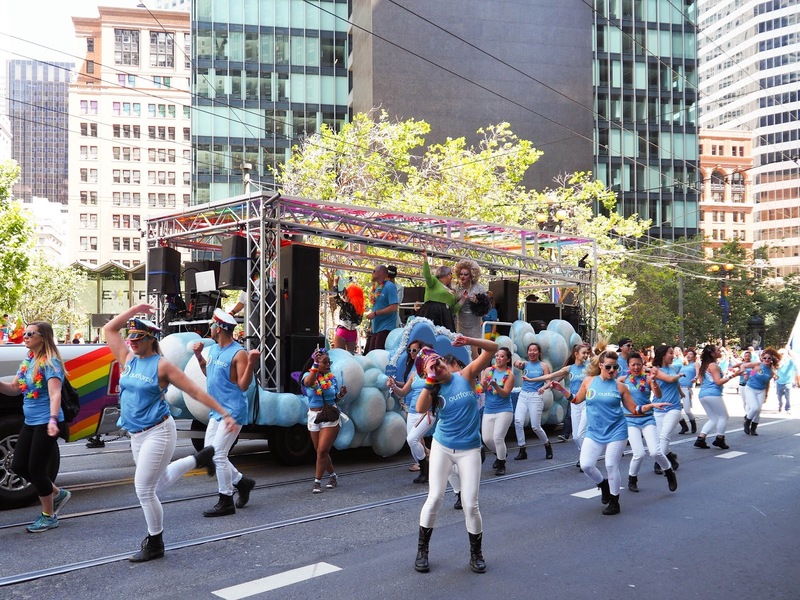 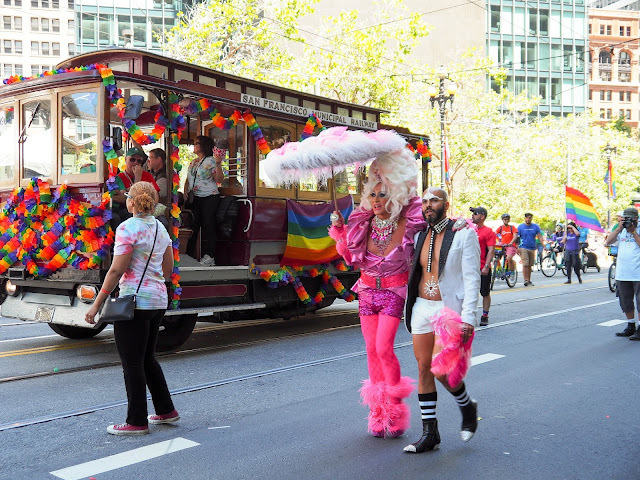 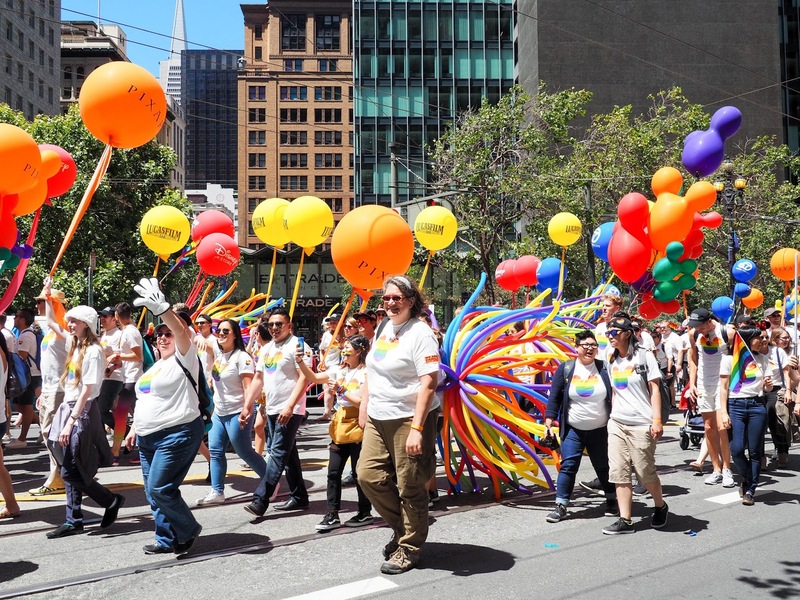 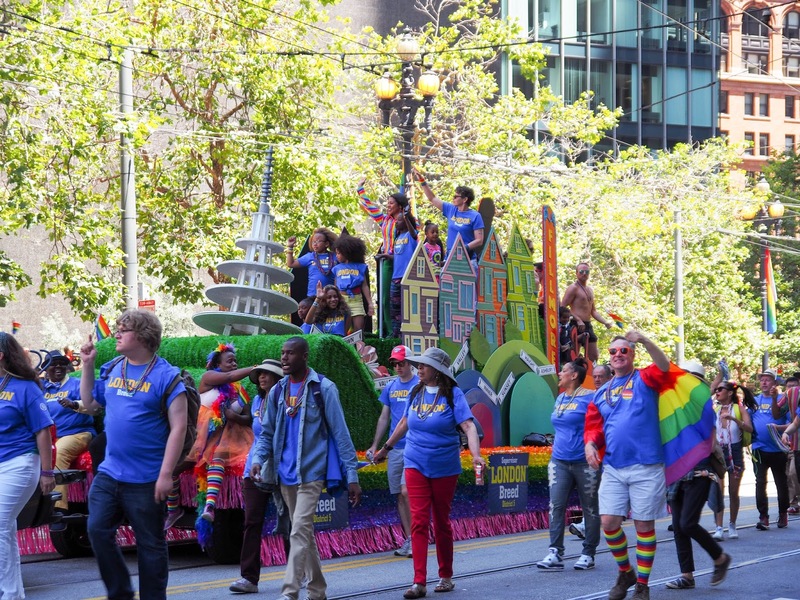 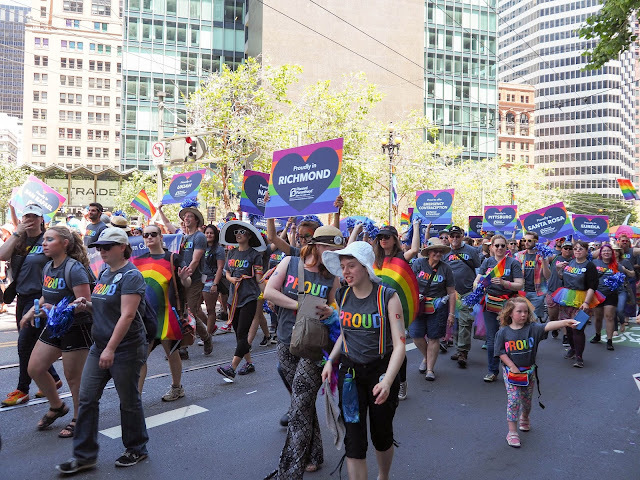 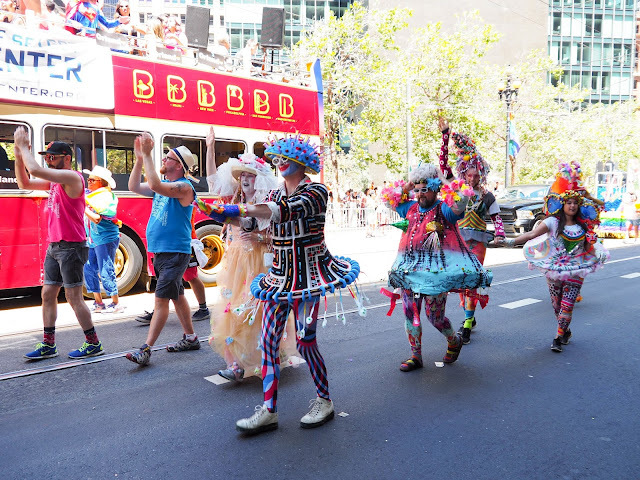 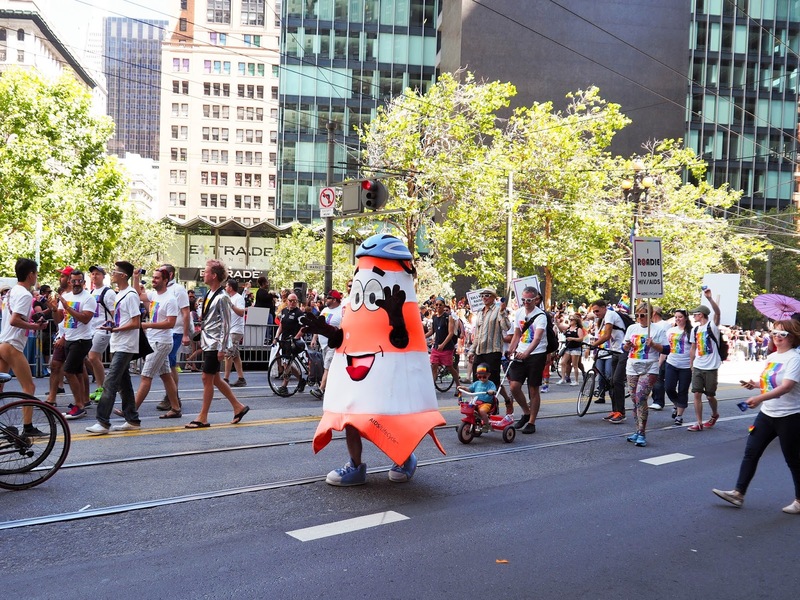 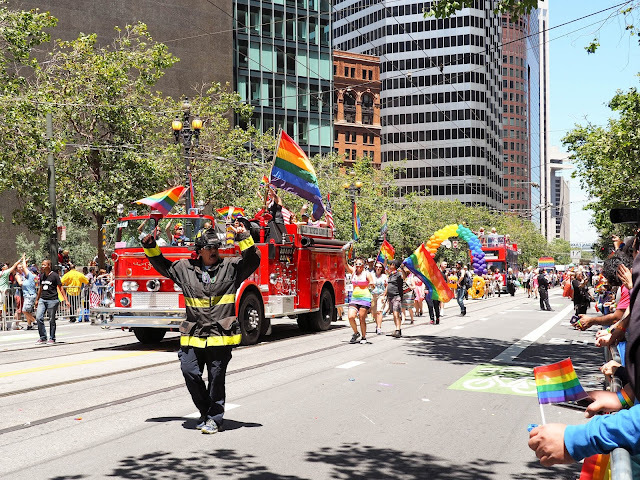 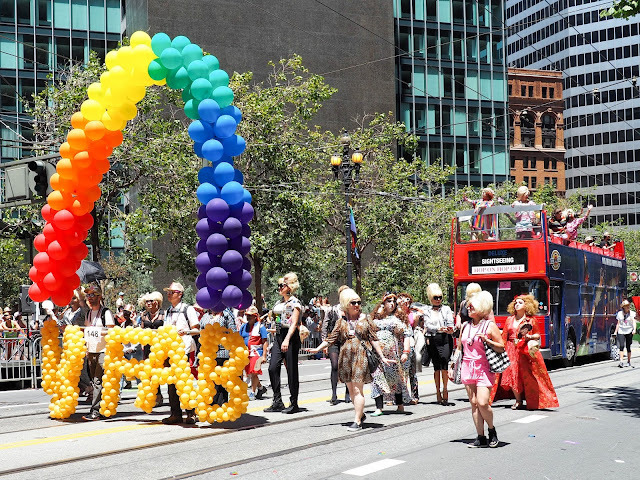 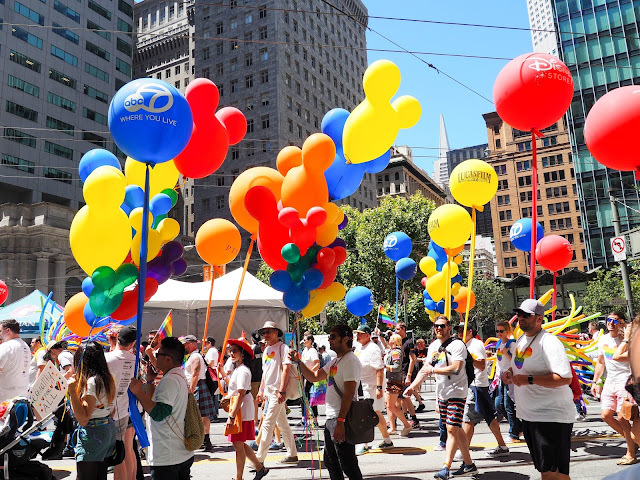 I'd been wanting to go to Pride ever since we moved to the Bay Area but the huge crowds, and extremely crowded train to get there, had put me off a little. Especially when Mathilde was a baby. 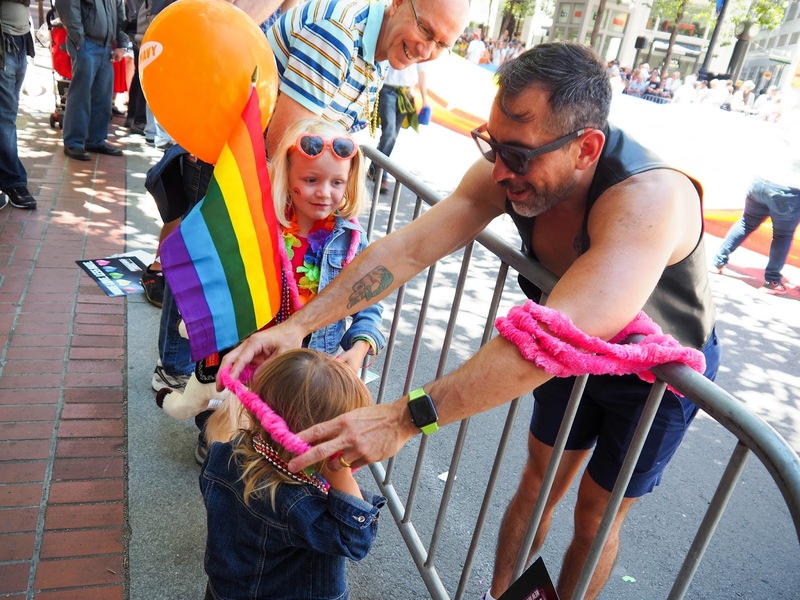 I know of plenty of other families that go every year though, so I thought it was about time we braved the crowds and join in the fun. 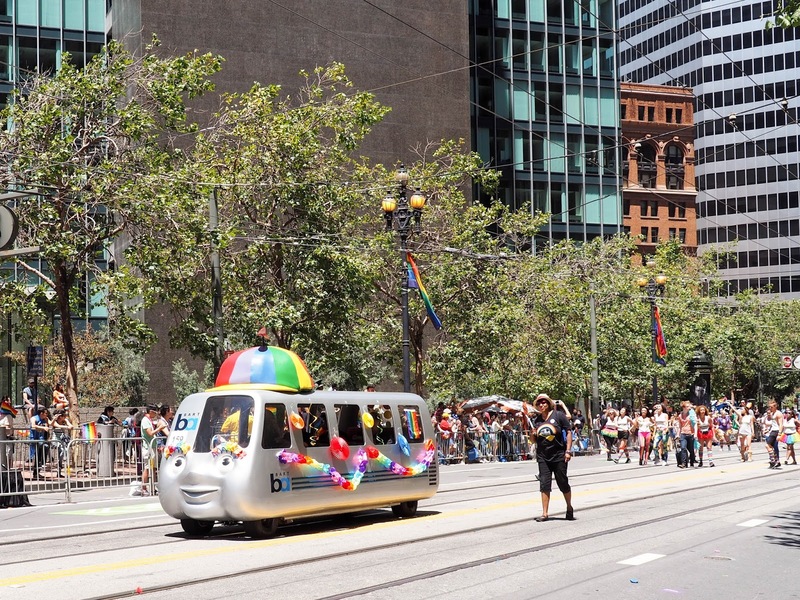 Surprisingly, BART (our train system) wasn't anywhere near as crowded as I had expected. Sure, it was standing room only by the time we got on, but it was still pretty comfortable. We got off BART at Montgomery Station in the Financial District and found ourselves a nice shady spot along Market Street where we spent the rest of the parade. Pride had a little bit of everything that Lola and Mathilde enjoy in a parade: lots of colorful floats, happy people, lots of music and dancing, rainbows everywhere, people passing out goodies, and, their favorite bit, the occasional nudie! 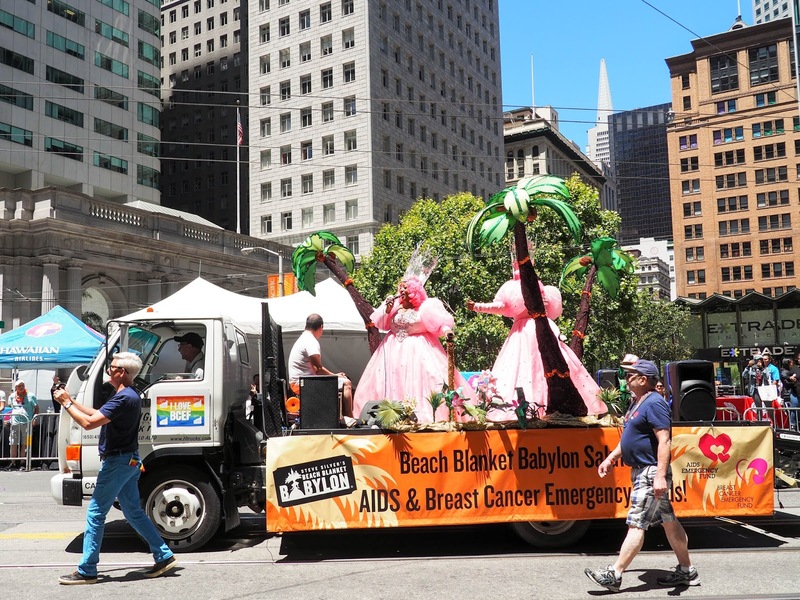 OK, so maybe that last one is just something you see in San Francisco parades! 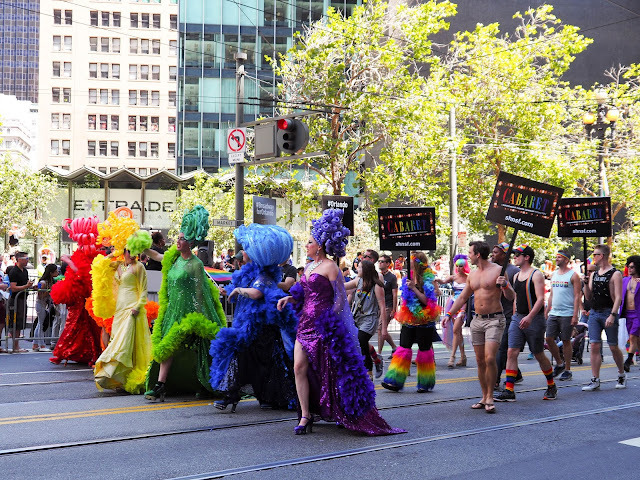 Having never been to Pride before I wasn't quite sure what to expect. 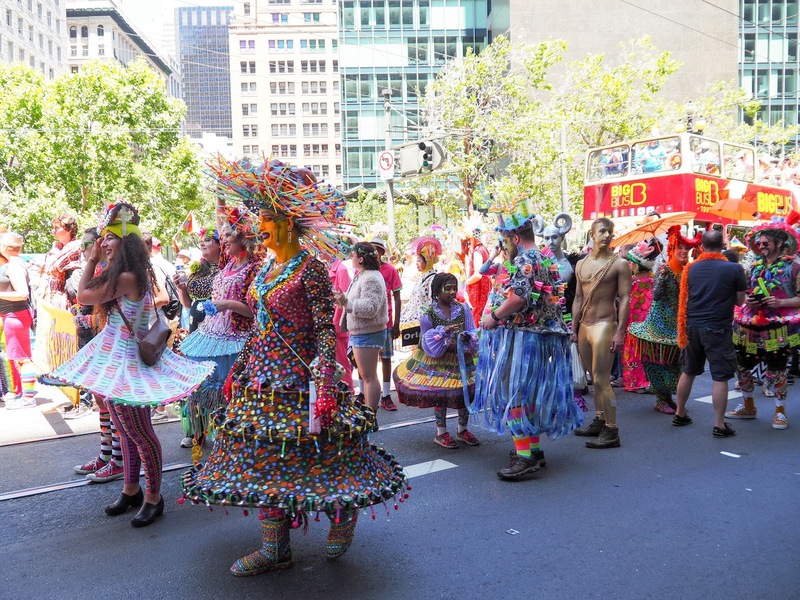 Kim and I had been to the Mardi Gras parade in Sydney quite a few times when we lived there pre-kids, and from what I remember, it wasn't necessarily the most kid friendly parade! 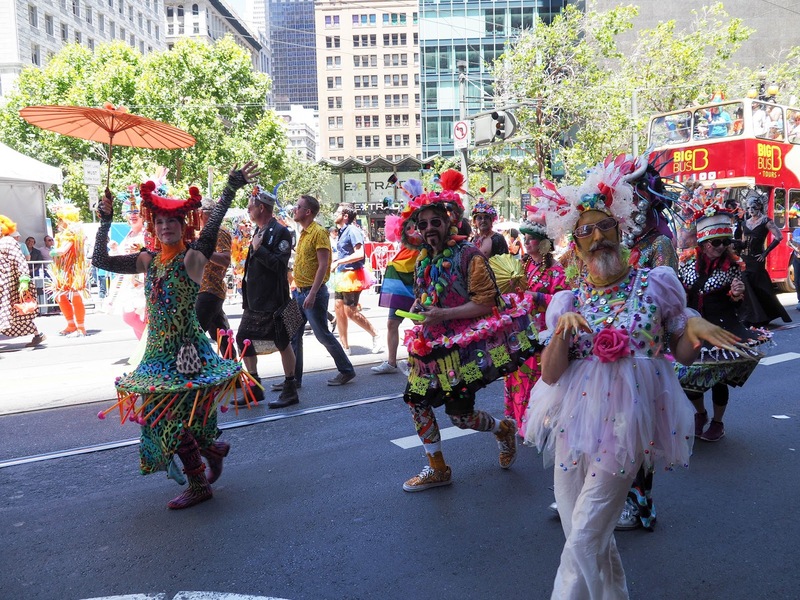 Sydney's Mardi Gras parade is held in the evening, while San Francisco's Pride parade is held during the day so I figured the parade here wouldn't be quite as risque. While there were definitely a few "more adult" groups at Pride, including those nudies, there was an overall sense of community and family throughout the parade. 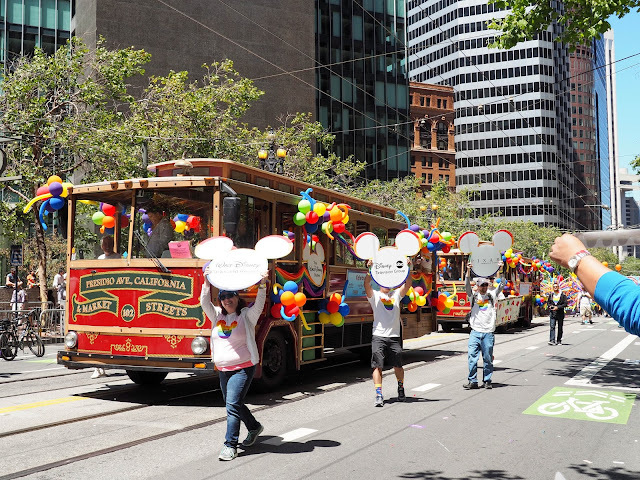 A lot of the Bay Area's big employers made up contingents in the parade. 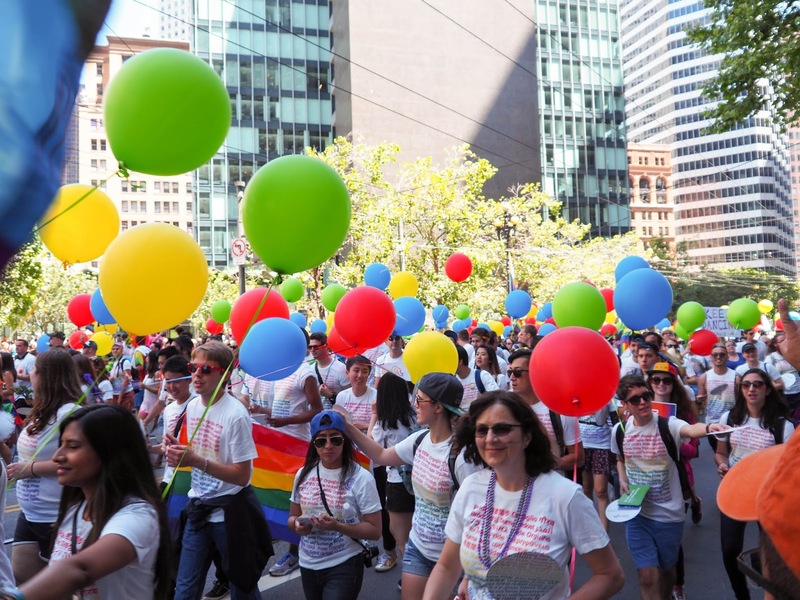 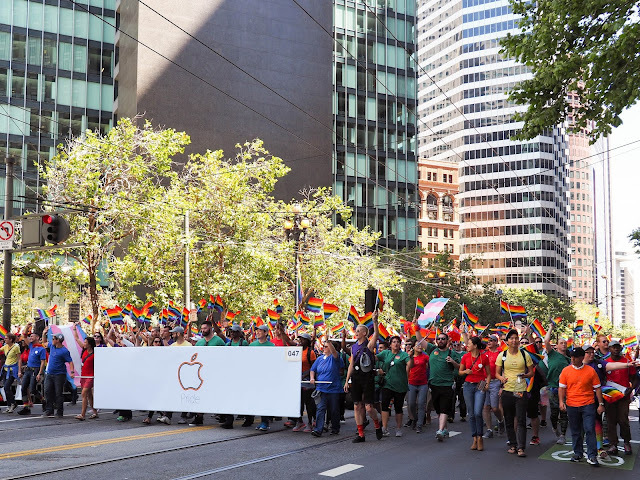 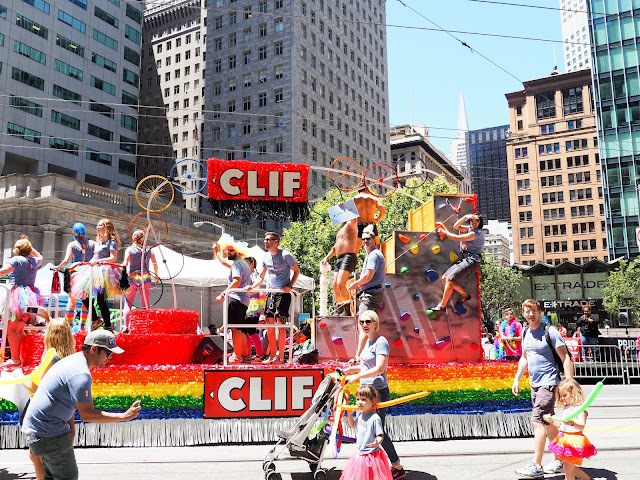 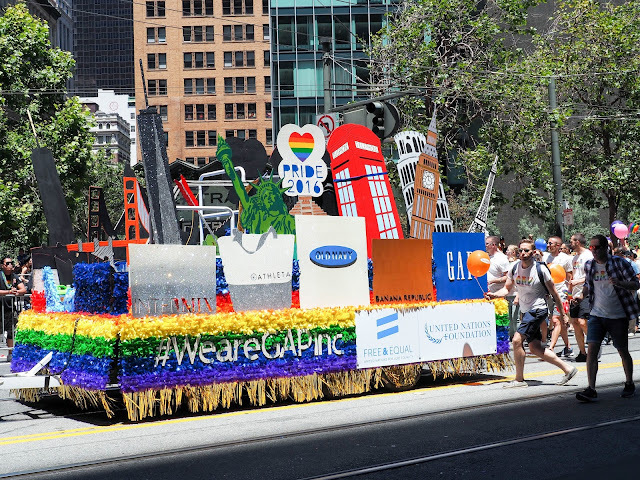 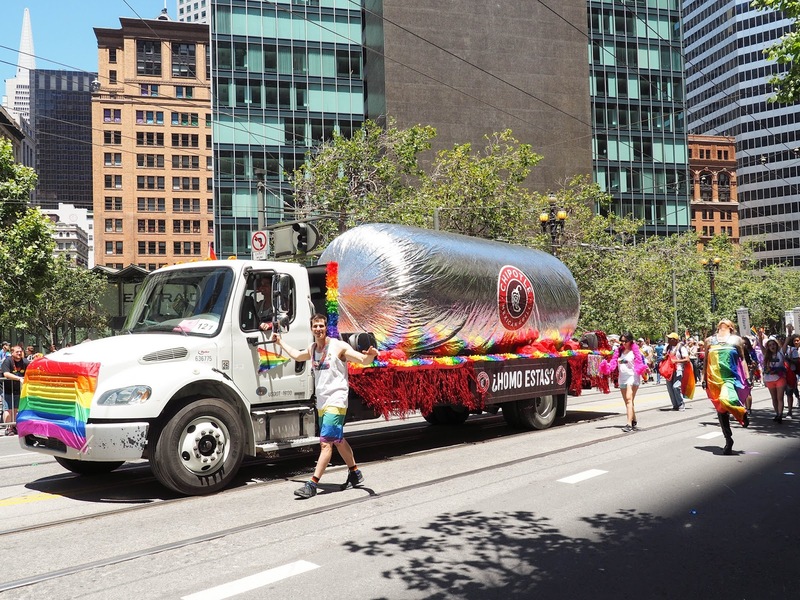 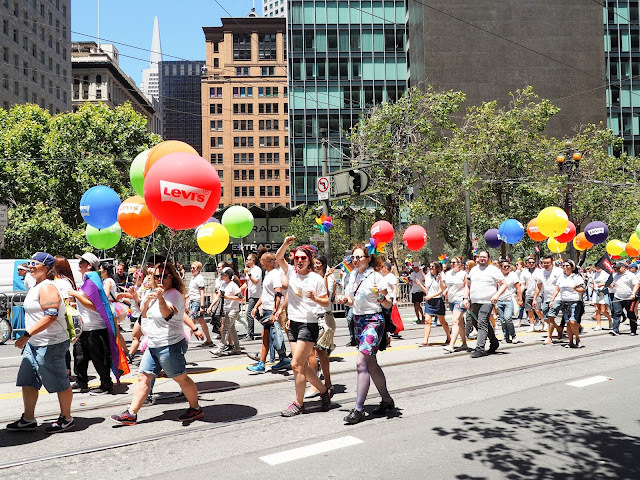 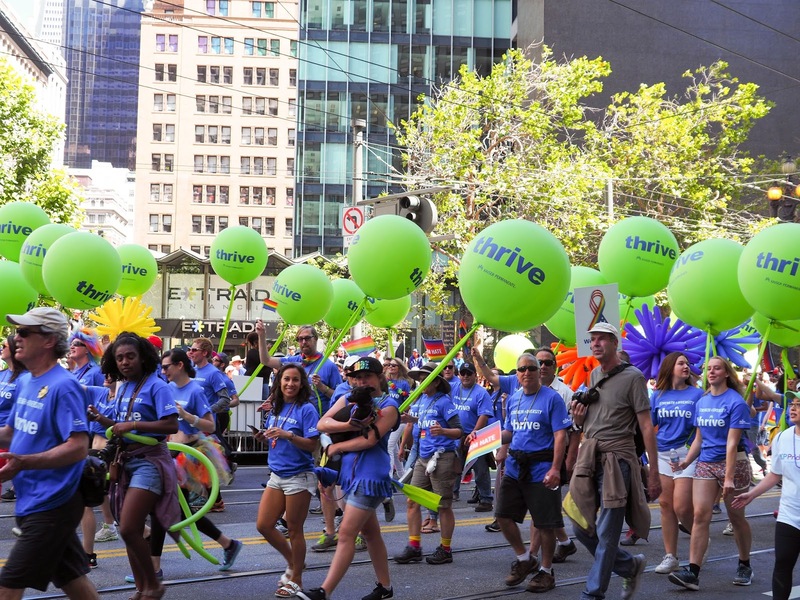 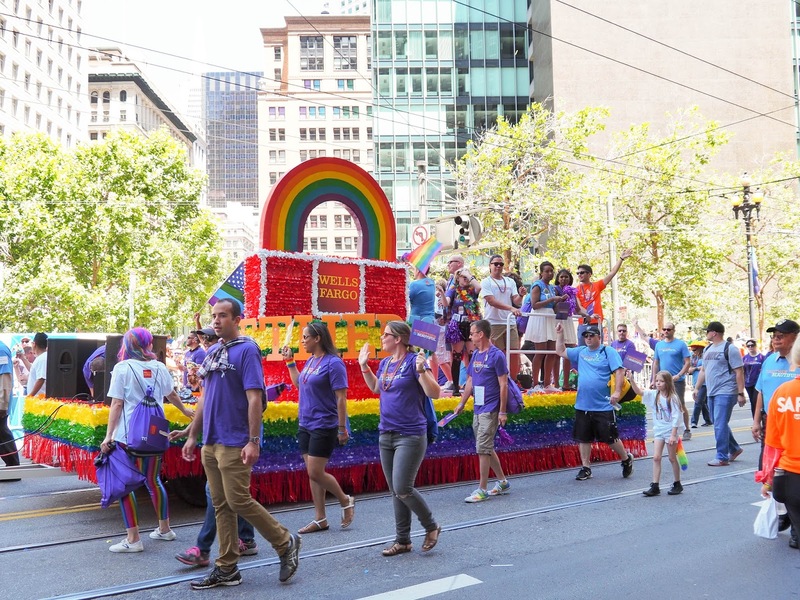 I heard a few people complain that the parade has become a little "corporate" but I've got to say that I love the fact that so many companies here support their LGBT employees and make such a big effort to be involved in the parade. 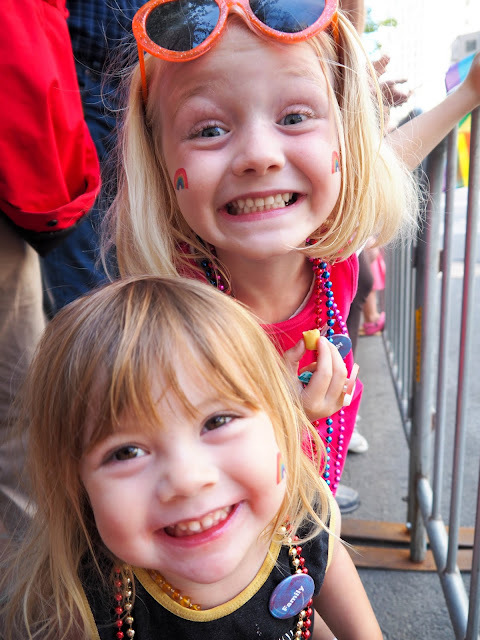 Both Lola and Mathilde were already decorated in rainbows when we arrived at Pride (they wore Tattly rainbow tattoos and rainbow striped Pride socks) but by the end of the parade they looked like a rainbow explosion! 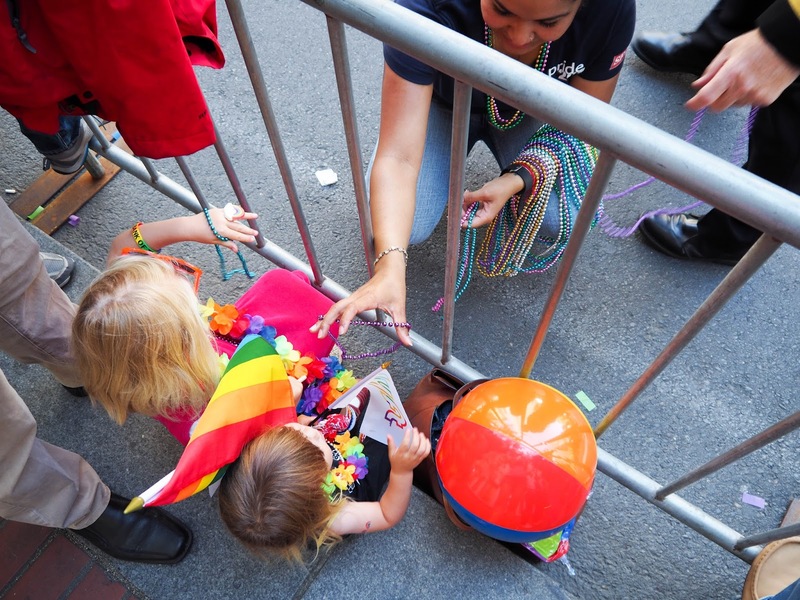 They had colorful beads and rainbow leis around their necks, rubber bracelets on their wrists, badges pinned to their outfits, and rainbow flags and fans in their hands to wave. 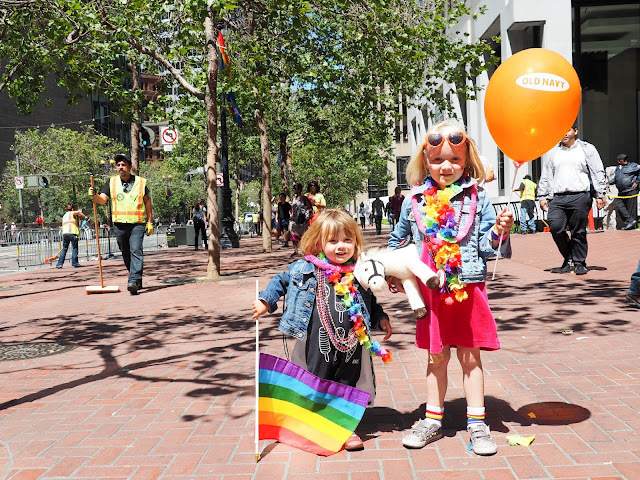 On top of all this they were also given candy, stickers, temporary tattoos, bubbles, cotton candy, bandanas, granola bars, sunglasses, lip balm, beach balls, balloons, and even a Wells Fargo plush horse! 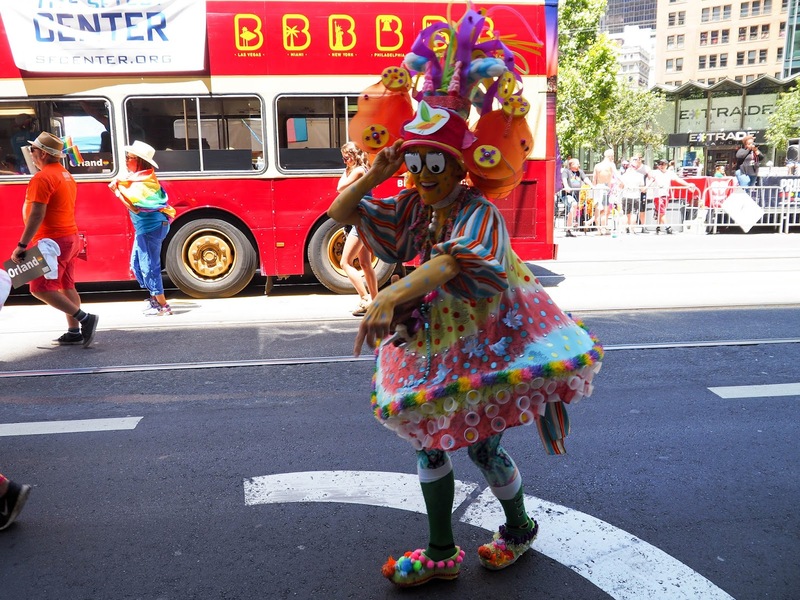 Oh, and at one point Mathilde was filmed dancing to the music so I'll have to watch the rebroadcast this Sunday or Monday to see if we can spot her! 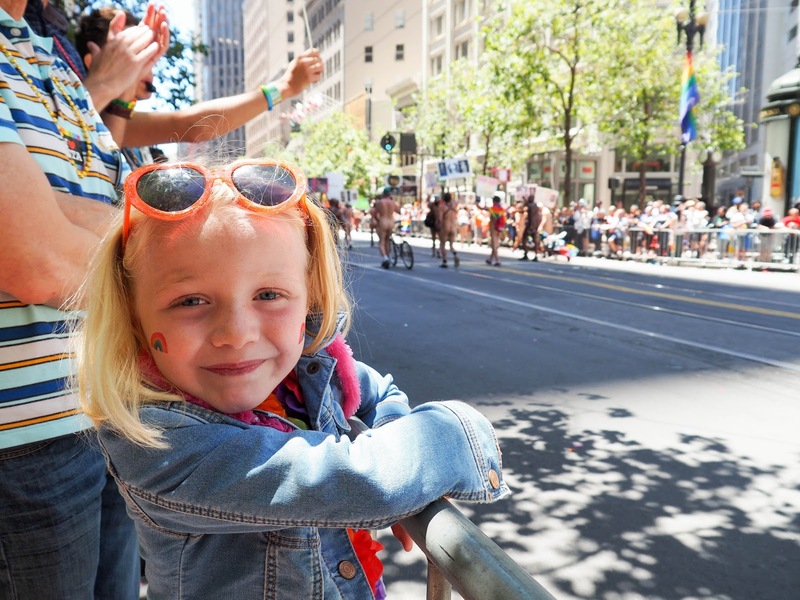 At the end of the day Lola declared that it was the best day of her life! 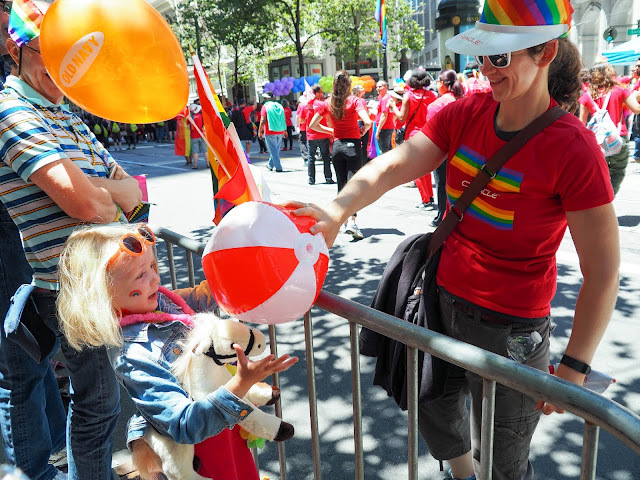 Rainbows, nudies, candy and plush horses make for a pretty fun day out. 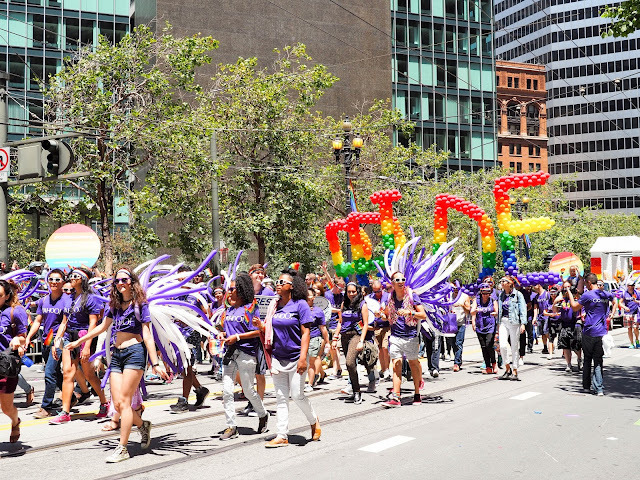 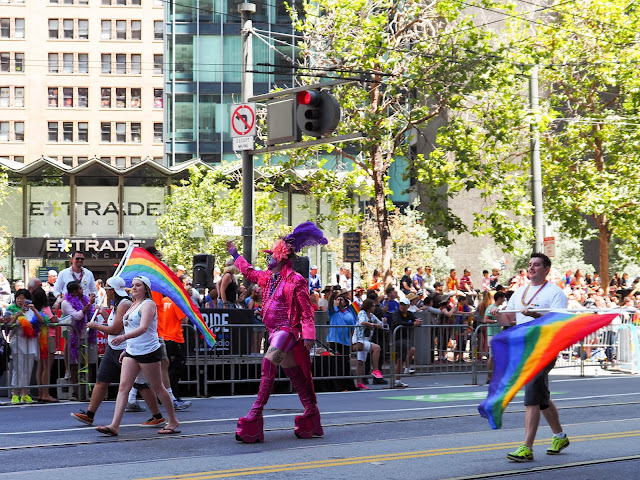 Here's a look at some of our favorite moments from Pride. 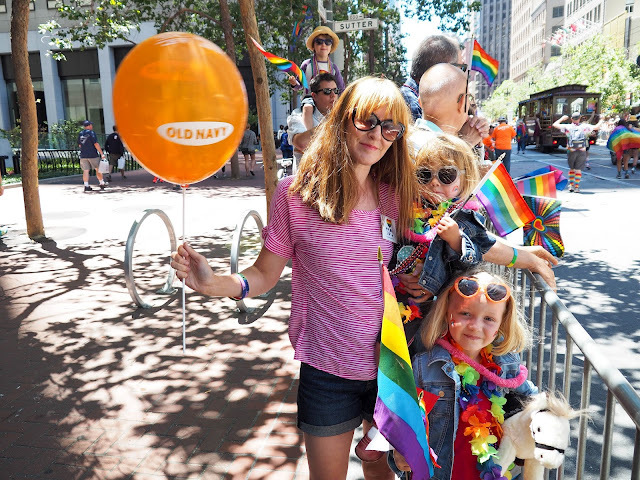 The girls and I had such a fun time at Pride. 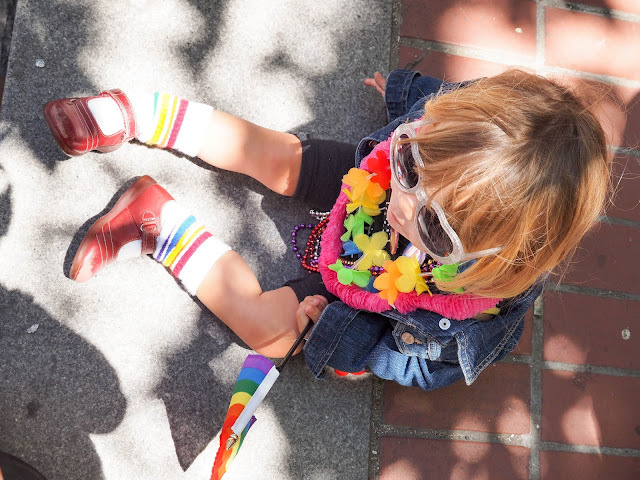 We'll definitely make sure to go again next year, and hopefully we'll be able to convince Ava that not all parades are lame! Have you been to Pride before? 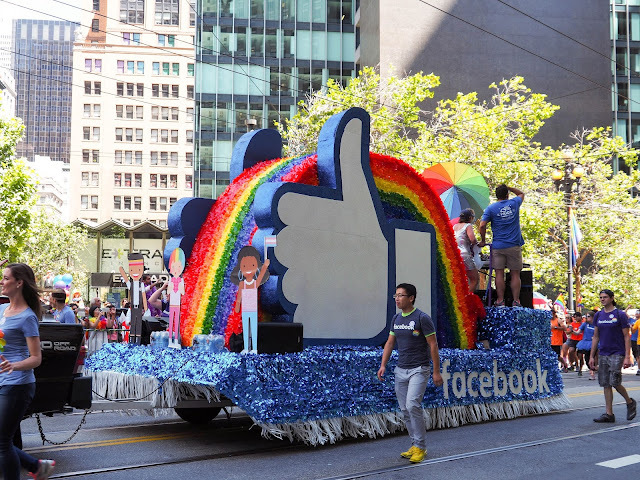 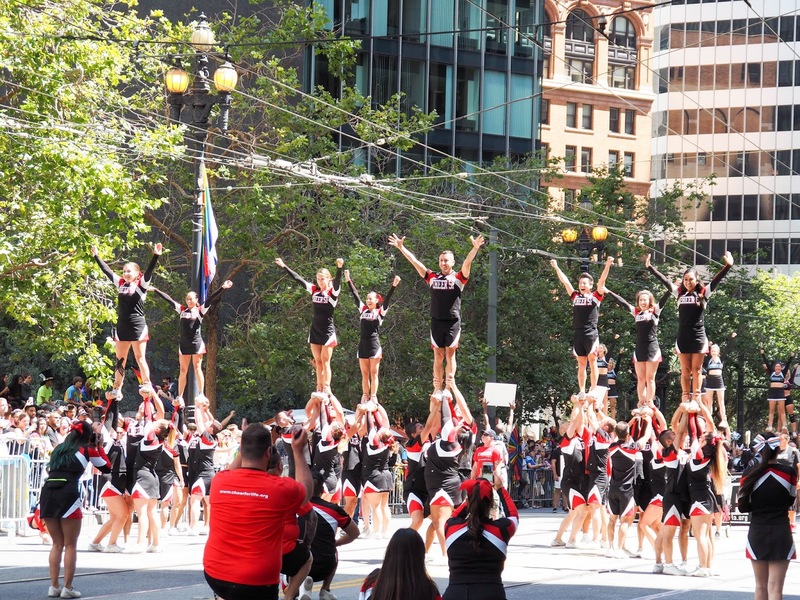 What other parades do your kids love? 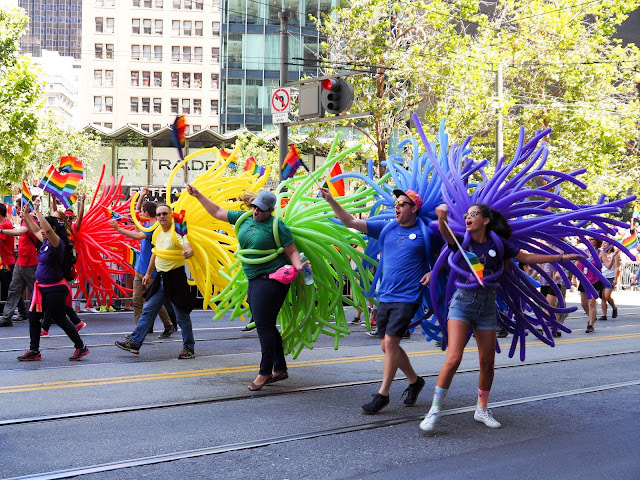 We usually go to the St Patrick's Day and Chinese New Year Parades too but Pride is definitely the most colorful by far!